Forty-eight-hour ceasefires between Syrian rebels and pro-government forces have reportedly begun in three towns. The truces will allow food and medical supplies to be delivered to the rebel stronghold of Zabadani, on the border with Lebanon, and to government-held Fuaa and Kafraya in the north-west. They were agreed by the rebel group Ahrar al-Sham and Lebanon's Hezbollah movement, an ally of Syria's president. Meanwhile, dozens of people have been killed in fighting around Damascus. Rebel fighters fired dozens of rockets at several central districts of the capital on Wednesday morning, killing four civilians and a soldier, officials said. Activists said the government had responded by carrying out air strikes on the suburbs of Douma, Kafr Batna, Saqba, Hamouriya in the Eastern Ghouta agricultural belt, killing at least 31 civilians and wounding more than 120 others. It comes after Amnesty International alleged in a new report that the government had committed war crimes against the 163,000 people living under siege in the Eastern Ghouta, with relentless aerial bombardment and shelling magnifying their suffering. Between January and June 2015, Syrian government forces carried out at least 60 aerial attacks on Eastern Ghouta, killing some 500 civilians, the report says. Many others are believed to have died from starvation or lack of access to adequate medical care. The 48-hour ceasefires in Zabadani, Fuaa and Kafraya began at 06:00 (03:00 GMT), according to Hezbollah's al-Manar TV. 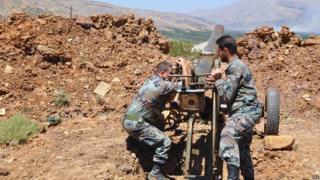 The Syrian Observatory for Human Rights said no fighting was reported on Wednesday morning. However, the UK-based monitoring group added that talks were continuing on evacuating rebel fighters from Zabadani and ending the sieges of the two government-held towns. "The ceasefire will begin and some [people] who are in critical condition will be evacuated. Talks will discuss further steps," a source close to the Syrian government told the Reuters news agency. Zabadani has been under attack for weeks by the Syrian army and fighters from Hezbollah, an Iranian-backed Shia Islamist movement allied to President Bashar al-Assad. About 45km (30 miles) north-west of Damascus, it is the last significant town held by rebel forces in the Qalamoun mountains, which run along the border with Lebanon. Last month, the UN envoy for Syria said government barrel-bomb attacks on Zabadani had caused "unprecedented levels of destruction and many deaths among the civilian population". Fuaa and Kafraya, two neighbouring Shia towns in the province of Idlib, have meanwhile been besieged by a rebel alliance that includes Ahrar al-Sham, a hardline Islamist group, and the jihadist al-Nusra Front, al-Qaeda's affiliate in Syria. The rebels have driven government forces out of much of Idlib in the past six months, and are now advancing on the coastal province of Latakia, the heartland of the heterodox Shia Alawite sect to which the president and his family belongs. On Tuesday, a military source confirmed that government troops had been forced to retreat and take up new defensive positions in the Sahl al-Ghab plain in eastern Latakia. More than 230,000 people have been killed since the uprising against Mr Assad erupted in 2011. Some 11.5 million others - more than half of the country's population - have fled their homes. The local ceasefires were announced hours before the arrival of Iranian Foreign Minister Mohammad Javad Zarif in Damascus. On Wednesday, Mr Zarif discussed regional crises with Hezbollah's leader Sheikh Hassan Nasrallah, including attempts to "find solutions in more than one country", al-Manar reported.